The One South serviced residences in Seri Kembangan, Selangor. PROPERTY developer Hua Yang Bhd is on track to complete another remarkable financial year, says its chief executive officer Ho Wen Yan. “We are on track to achieve our sales target of RM350mil (13% year-on-year increase) for the current financial year. Based on the first quarter results, we should hit more than RM200mil in revenue,” Ho says in an interview. Ho: We do not buy land that is deemed to be expensive. For its recently concluded first quarter ended June 30, the group achieved sales of RM164mil. For its first quarter, Hua Yang posted a 135% year-on-year jump in net profit to RM11.5mil while revenue rose 66% to RM61.8mil due mainly to better sales performance, steady construction progress recognition and the completed sale of a 215,186 sq ft plot to Tesco Stores (Malaysia) Sdn Bhd for RM3.23mil at the group's Bandar Universiti Seri Iskandar township development in Perak. Hua Yang, which is known for developing residential properties in the affordable segment, posted a 117% year-on-year increase in net profit to RM25.1mil while revenue rose 82% to RM188.9mil for the financial year ended March 31 (FY2011). It was a record-breaking full year financial performance, which was attributed to better sales achieved, since Hua Yang's listing on the Main Board of Bursa Malaysia on Nov 29, 2002. For FY2011, the group's earnings per share stood at 23.29 sen (117% higher compared with the last financial year) while sales achieved grew by 123% year-on-year (from RM139.3mil to RM310.2mil). Founded in 1978 by Ho's late father Ho Mok Heng, Hua Yang's first project was eight units of four-storey shophouses in Ipoh, Perak valued at RM2.4mil. To date, the group has completed over 10,000 residential, commercial and industrial properties with a gross development value (GDV) of RM1.2bil in the Klang Valley, Johor, Perak and Negri Sembilan. In the last five financial years, the group has enjoyed compounded annual growth rate (CAGR) in profit after tax of 24%, revenue CAGR of 24% and earnings per share CAGR of 20.6%. The group aims to be a leading developer in the affordable property segment with an annual revenue of RM500mil within the next five to seven years. Ho says the group's growth will be driven by demand from young Malaysians in a country with a rapidly growing population. He points out that the 2010 Population and Housing Census report showed Malaysia's population totalled 28.3 million (23.3 million in 2000). The group's data shows that most of its customers are first-time property buyers who are owner-occupiers aged from 25 to 40 years old. Ho says there are good margins to be made in the affordable property segment where current prices are generally RM400,000 and below. According to him, the group has been able to stick to its affordable property tagline over the years, despite rising land and construction costs, due to prudent acquisition, building design and management policies. Among the toughest challenges ever faced by the group was rapidly rising building material prices in the period before the global financial crisis hit in 2008. Presently, the group has an undeveloped landbank of 320ha with a potential GDV of RM2.4bil. The bulk of its remaining landbank is in Perak (62%, 198ha) and Johor (26%, 84ha). The group's biggest ongoing project is the 314ha Bandar Universiti Seri Iskandar township in Perak. Bandar Universiti Seri Iskandar, which started in 2001, is slated to have 6,053 residential and commercial units. About 63% or 198ha of Bandar Universiti Seri Iskandar remains to be developed, with a potential GDV of RM872mil. Another major township project is the 193ha Taman Pulai Indah, which is located 28km from Johor Baru. Development for Taman Pulai Indah also started in 2001, and the township will eventually have 4,942 residential and commercial units. Another 29ha in Taman Pulai Indah remains to be developed, with a potential GDV of RM157mil. Hua Yang is also developing the 11ha Senawang Link, consisting of 85 units of commercial and industrial lots, located along Jalan Tampin, Seremban and adjacent to the Sungai Gadut KTM train station. The estimated GDV of Senawang Link is RM45mil, and its first phase of 52 units of one-and-a-half storey terrace factories launched in March last year has a take-up of 23%. Meanwhile, its first major residential project in the Klang Valley was Symphony Heights in Selayang, Selangor. The first phase was launched in June 2008, and facilities include a swimming pool, squash courts, a community hall, cafeteria, children's playground and a gymnasium. 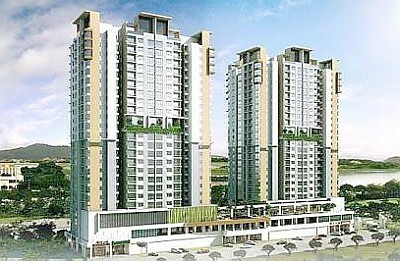 Symphony Heights consists of three blocks of 946 service apartments on a 1.2ha leasehold plot with a GDV of RM206mil. Sized from 863 sq ft to 1,246 sq ft, the units were retailed at prices ranging from RM135,200 to RM306,500. To date, Symphony Heights has a 94% take-up. One South is Hua Yang's biggest project in the Klang Valley, with a GDV of RM840mil, consisting of shop offices, service apartments, SOHO (small office/home office) units and office towers on a 6.8ha plot in Seri Kembangan, Selangor. The response to One South has been strong, with a high take-up for the three phases launched within the past one year. Last month, the group launched 377 units of Gardenz service apartments, sized from 1,020 to 1,220 sq ft and priced from RM380,000 onwards in One South. According to Ho, one block of Gardenz units have been fully sold while another block has seen high demand. The Gardenz serviced apartments feature nine units per floor, served by three lifts, and each unit comes with two covered car park bays. Facilities will include an infinity edge lap pool, wading pool, jacuzzi, sauna/steam room, gymnasium, a jogging track, two squash courts, a basketball court, indoor badminton courts and a snooker room. One South is served by the Kuala Lumpur-Seremban and Besraya highways, with landmarks in the area including Palace of the Golden Horses, South City Plaza and The Mines Shopping Mall. The Gardenz serviced apartments, with a GDV of RM160mil, is the third phase to be launched in One South after retail and office units in Phase 1 and 418 units of Parc service apartments in Phase 2. The retail units and Parc service apartments have been fully sold while the office units have seen a 73% take-up rate. The retail and office units are sized from 479 to 2,100 sq ft, and were launched at prices starting from RM750 and RM350 per sq ft respectively. Phase 4, consisting of SOHO units is due to be launched in mid-2012 while phase 5 featuring two blocks of office towers in 2013. Ho says Hua Yang's double-digit annual growth strategy was planned about five years ago with major forays into the Klang Valley as a key step. This year, Hua Yang aims to launch RM525mil worth of properties. “Including RM190mil of properties that were launched but not sold last year, this means we have RM715mil worth of properties to sell this year,” he says. Upcoming launches include 294 single and double-storey terrace houses with a GDV of RM63mil in Taman Pulai Indah, Johor in September 2011. Also in the works are 147 double-storey houses with a GDV of RM33mil in Taman Pulau Hijauan and 31 semi-detached houses in Polo Park in the fourth quarter of this year. Both projects, with a combined GDV of RM63mil, are located in Johor Baru. The group has also acquired more land in the Klang Valley this year, with the purchase of a 0.63ha plot in Desa Pandan, Kuala Lumpur for RM32mil and a 1.5ha leasehold site for RM13mil in Section 13, Shah Alam. Both sites are slated for mixed commercial and residential projects, with estimated GDVs of RM160mil and RM175mil for the Desa Pandan and Shah Alam projects respectively. He says SOHO units sized between 700 and 900 sq ft are planned for the Desa Pandan project while residential apartments sitting on a podium with retail elements are in the pipeline for the Shah Alam development. The Desa Pandan and Shah Alam projects are due for launching in 2012 and early 2013 respectively. The group is also looking at acquiring land in Sabah and Penang. A recent note issued by Inter-Pacific Research says that as at June 30, Hua Yang had total borrowings of RM73.4mil and cash of RM6.2mil, translating to net gearing of 29%. “Our net gearing is low, and this allows us to acquire land when the time is right,” he adds. At the moment, Hua Yang plans to remain in the affordable property segment. On Tuesday, Hua Yang announced that it had acquired two parcels of land, sized at 2.1 acres in total, in Johor Baru for RM10.7mil.The land parcels, adjoined to each other, are along Jalan Abdul Samad in Johor Baru, and located only 3.5km from the Sultan Iskandar Customs, Immigration and Quarantine (CIQ) complex. The land parcels are slated for a residential development consisting of serviced apartments, catering for young professionals and families working in Johor Baru or Singapore. with a tentative selling price range of RM150,000 for a studio apartment and up to RM400,000 for a three-bedroom unit, the estimated GDV of the project is RM120mil. By the end of this month, the 37-year-old Ho would have spent a year helming the group after succeeding his uncle Ho Mook Leong as Hua Yang's chief executive officer in August 2010. However, the British-trained architect says he cannot claim credit for the group's impressive financial performance in recent times. Wen Yan, who also holds a Masters of Science (construction economics and management) from University College London, says his career in the group was not planned. Before joining Hua Yang in October 2003 as a project co-ordinator at the group's Johor operations, he had spent about three years working in London. “I had an independent career in London. However, after my father passed away in 2002, some family decisions were made and I joined the group,” says Wen Yan. Later, he became general manager in April 2006 and moved to Kuala Lumpur to help grow the group's Klang Valley operations. The following year, he was promoted to chief operating officer and executive director. Ho says his experiences as an architect have helped in giving Hua Yang's properties more contemporary designs. PROPERTIES, by and large, feature significantly in our lives. A large number of us spend the better part of our lives working to pay off a mortgage. But the need for a place to live in is no longer the main driving force behind our desire to own a property. In fact, many people now invest in properties for a slew of other reasons. To meet changing expectations from home purchasers and investors, developers and even financiers have to become more innovative. New ideas, concepts and designs are being introduced regularly to attract the potential buyer. Apart from making their properties more attractive to potential buyers, developers, in collaboration with financiers, are also making it easier to buy a property. What then, are the factors that induce the average person to make that commitment to part with a large portion of his future earnings just so he can own a piece of property? What makes him think that this is an investment that is worth making? The first, for both the home purchaser and the investor, is the hope that the value of the property will rise significantly so it can be sold eventually for a tidy profit. This, I believe, is very clearly reflected in the vibrant property market in Malaysia. Browsing the classifieds pages of the daily newspapers, you will have an idea of how much buying and selling there is in the property market. There is not very much a developer has to do to convince a potential buyer that the value of his property will be much higher on some future date. Buyers of properties in newly launched projects can even re-sell fairly quickly and in the process make a substantial profit. For instance, a multi-storey apartment block in a mature part of Petaling Jaya was selling at RM280 to RM290 per sq ft when it was launched in 2007. Just three to four years later, the apartments were already in the secondary market for RM420 to RM490 per sq ft.
To hype up the potential gains, some developers even highlight the quantum of returns an investor can expect to make from their properties. However, the desire for financial gains is not the only requirement developers have to satisfy if they want to attract more buyers. Developers have to incorporate new and innovative ideas into the concept and design of their projects to promote a desirable lifestyle associated with their properties. By incorporating such concepts and designs, developers are differentiating their projects from others. For the purchaser, it is an investment that will eventually offer him the reality of an exclusive lifestyle. This new lifestyle no longer revolves around (just) an expensive apartment in a posh area in the city, with the requisite swimming pool, gym and private lift. For many high-rise projects, such facilities are now standard. For some, the apartment must be a sanctuary from the hustle and bustle of city life, never mind that it is located in the city centre. Or it must be designed to evoke a lifestyle from another era. But even as developers manage to meet all the desires of a potential purchaser, some may still hesitate to take out the chequebook. It is, after all, a huge investment and a commitment that will span many years. To make it easy for potential buyers to make that commitment, there now are many easy payment schemes that give buyers an extended period of time to pay the first 10% or 20% down-payment. All they need to do is to pay an affordable amount to affirm their desire to purchase the property. However, there is a downside to this arrangement. People can very quickly commit themselves to several pieces of property and soon find that they cannot actually meet all the long-term financial obligations. That, too, is not the only way financial institutions have made it easier for people to purchase property. Some banks also offer loans with significantly longer repayment schedules, even stretching over two generations. This concept is based on the understanding that many parents fear that property could be priced beyond the means of their children in the future. To beat the price increase, parents opt to purchase property now for their children's use when they grow up. Loans are given on terms that enable the parents to begin the monthly instalment payments until such time when the children start to earn an income so they can take over the responsibility until the loan is fully paid up. However, there is a risk to this arrangement. It is impossible to foresee how well the children will do in their adult life, whether or not they will find a job that will earn them enough money to take over the commitment. In fact, a child may not even want that property, never mind that it had been purchased at a much lower price. Easy payment schemes and exclusive lifestyles aside, there are many other issues that matter to home purchasers. Security is one of them. A safe neighbourhood is no longer enough. Gated and guarded communities have sprung up, taking the lead from high-rises where 24-hour security surveillance was first introduced years ago. The list of such demands from home purchasers and investors will only get longer. And every new addition or innovation will likely come at a cost. The challenge for developers is to meet these demands without adding too much to the cost. In the end, if the customer is satisfied, it would have been a sound investment, not just for the homebuyer but the developer as well. Another investment: D2 Private sold the office block in St James’s Square to the EFP for £150mil. PETALING JAYA: The Employees' Provident Fund (EPF) has confirmed that it has purchased an office block in St James's Square, London, where one of the tenants has one of London's highest rents. 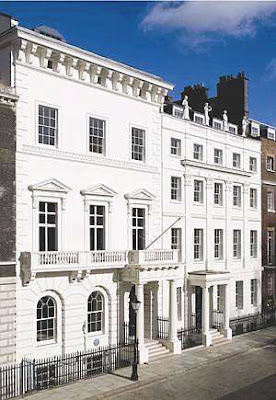 The EPF told StarBizWeek that it bought 12 St James's Squares for 150mil (about RM740mil) from D2 Private, the leading Dublin-based Irish property investment company. The deal was completed on Aug 11. This marks the EPF's fourth property investment in London since announcing an allocation of 1bil for British property purchases about a year ago. Including this latest purchase, it has spent 634mil. The latest purchase is centrally located in one of London's most elegant West End squares. The seller D2 bought the building in 2006 for 60mil and refurbished the classic 81,500 sq ft Georgian building for another 20mil. Eighteen months after buying it, D2 rented the top two floors to hedge fund Permal Investment Management Services at what was then considered the world's highest rental ever at between 140 and 130 per sq ft. The West End market has failed to reach rents of that level since. Only earlier this year did they pass 100 per sq ft.
D2 is founded by Deirdre Foley, and David Arnold. Foley was previously a director of the Quinlan Partnership and is D2's managing director while Arnold is a well-known Irish property developer and investor. The EPF last year handed ING Real Estate Investment Management and RREEF the mandate to invest 500mil each in central London on its behalf. So far the fund has invested outside the core West End in a bid to find investments that yield more than 5%. The EPF's three other property assets include commercial building Whitefriars in central London which it bought from Union Investment for 148mil in March. Whitefriars has a annual yield of 5.75%. Property consultancy Savills brokered that deal. Prior to Whitefriars, the EPF bought One Sheldon Square in Paddington Central for 156mil, and 40 Portman Square near Oxford Street for 180mil. The two properties have yields of 5.75% and 5.55% respectively. Properties in the city of London was among the first to start recovering from the financial crisis, rising in the second half of 2009 after two years of declines erased 50% of its value from city-centre office values. The pound sterling's 22% drop since September 2007 had helped make property more attractive to foreign buyers, according to a report by Bloomberg. Since 2009, when prices of London assets begin its uptrend, spending in London's prime real estate shows no sign of abating, a deep contrast to the overall state of the UK property market which has been soft until today. In the city, investors are turning to more affordable markets or riskier properties because of the shortage of prime real estate for sale and the high prices it commands. For the first half of this year, about $12.3 billion has been spent on prime offices, shops and homes in London, the most of any city, Real Capital Analytics's research shows. Last week's disorder and looting in London has not diminished the appeal of investing in the city, according to Jeremy Helsby, chief executive officer of Savills Plc. “There's no evidence of an unwillingness to invest in London,” Helsby says after the property broker reported a 52% increase in first-half profit. “I can't think of any set of circumstances of London not retaining its status as a destination for international capital,” he told Bloomberg. JAKS Resources Bhd’s subsidiary JAKS Island Circle is acquiring a land in Petaling Jaya from Star Publications (M) Bhd for RM135 million. Located next to Jaya One commercial centre, the land has been planned to be turned into a mixed development consisting of residential, commercial, office and recreational areas.